Moral regulation is coextensive with state formation, and state forms are always animated and legitimated by a particular moral ethos. Centrally, state agencies seek to give unitary and unifying expression to what are in reality multifaceted and differential historical experiences of groups within society, denying their particularity. The reality is that bourgeois society is systematically unequal, it is structured along lines of class, gender, ethnicity, age, religion, occupation, locality. States act to erase the recognition and expression of these differences through what should properly be conceived of as a double disruption. While I would now (of course) no longer endorse all of the historical specifics of the analysis Philip and I presented the best part of thirty years ago, I see little to quarrel with in this as a starting-point for demystifying “the state” and what is done to people under its auspices and in its name. The omission of different sexualities as a key axis of structured inequality, maybe. But anybody interested in where I would nowadays want to qualify the (overly) grand narrative of English history offered in The Great Arch might want to look here. 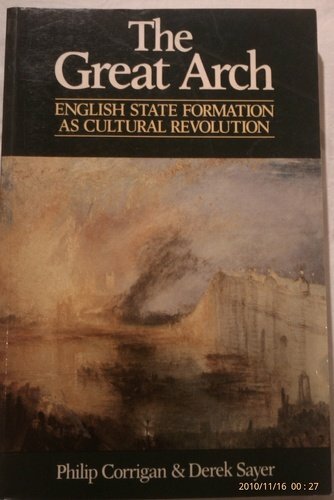 For good or ill, The Great Arch has had considerable influence on thinking about “the state” across humanities and social science disciplines over the last three decades. Though Blackwell issued a (very small print-run) second edition in 1991, the book has long been out of print and copies sell for ridiculous prices secondhand (one is listed today on amazon.co.uk for £336.64). Since the rights have now reverted to the authors, I decided to put it up on academia.edu, where it can be legally downloaded free. The text is that of the first (1985) edition. Extremely grateful to you for putting this up online! I am looking at practices and moral discourses surrounding relief at the end of the 19th C and this text looks like a great place, as you say, to begin de-mystifying the state. From the above excerpt, I’m interested in whether or not the Schmittian idea of sovereignty as the power to define the exception figures in the book. Anyway, I will get reading – cheers!